Ha! With the show over, you thought I was done blathering on about Lost. But thanks to the inclusion of a new 12 minute epilogue on the show's sixth season DVD release, there's more Lost to be had! 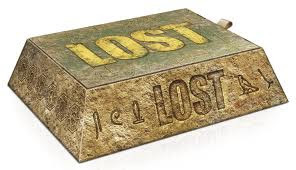 Truth be told, I haven't discussed or thought about Lost much since posting my analysis of the finale a few months ago; whenever I do, I tend to recall all the dangling plot threads and incomplete narratives, and angry up my blood in the process. And while Lost stands as a flawed and imperfect narrative, there's still plenty to like about the show, and I don't want to always recall it with anger and frustration (or to spew bitterness when discussing it). Thus, I gave myself some distance from it, in the hopes that time will ease my frustration. With the release of the sixth season on DVD and Blu Ray bringing Lost back to the surface of my personal pop culture consciousness, I find my frustration and bitterness still lingers, especially at the surface (upon reading a post on Nikki Stafford's blog about a new series of "trailers" focusing on Lost's themes, my first thought was "will one of those themes be 'unfinished narratives?'") though thankfully, they're less raw these days. SPOILERS AHOY! 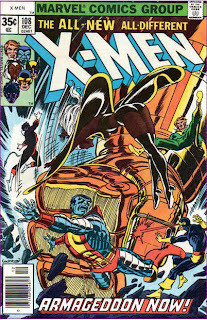 "The New Man In Charge" essentially tells two tales of Ben, as Hurley's number two, tying up a few loose ends in the wake of the regime change on the island. In the first, he visits a Dharma warehouse on Guam, abruptly announcing its closure to the two employees still working there. 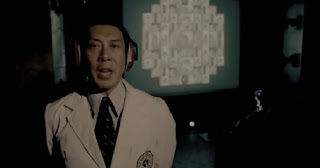 In the process, he answers some of their (and the audience's) questions regarding the pallet drop seen in season two and shows a DVD copy of the Hydra orientation film, which confirms or further hints at several fan theories, including for what the polar bears were being trained, the source of the fertility problems on the island, and the purpose of Room 23. 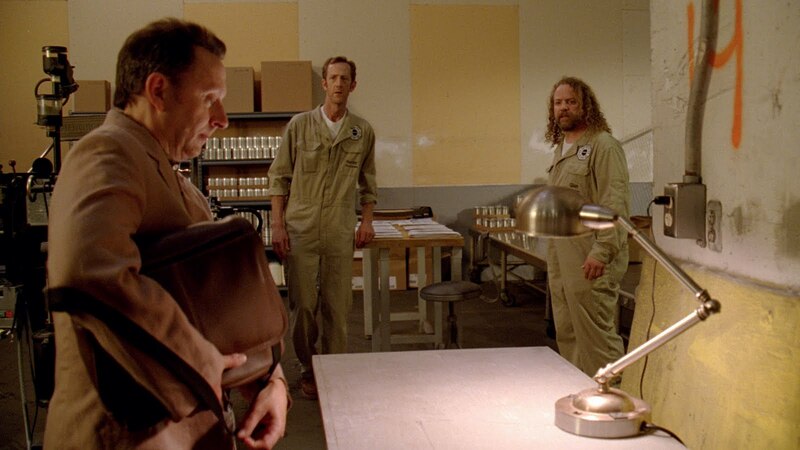 The second visit Ben makes is to a now-gargantuan Walt, residing in Hurley's old mental hospital. Ben apologizes to Walt for everything he put him through, and contends that he is trying to take responsibility for his past transgressions. He confirms, once again, Walt's specialness, and offers him a job and the opportunity to help his father, despite Michael being dead. The pair are met outside the hospital by Hurley. Walt wondered if anyone was ever going to come back for him, and Hurley affirms that Walt belongs on the island, and the three set off for "home". Of the two stories, the first is, perhaps, a bit too on the nose (though clearly that was intentional), with the indignant Dharma employees standing in for the viewers ("we deserve answers!" they say, echoing many a Lost fan, including myself). Ben tells them they can each ask one question (follow up questions are not allowed, of course) and shows them a DVD intended to answer them (just like we're watching all this on a DVD, hoping to get answers!). The second story is classic Lost, using character work to make us feel like we're getting answers when in reality, we're just getting more questions, and the answers we're getting aren't necessarily the ones we really wanted to know. 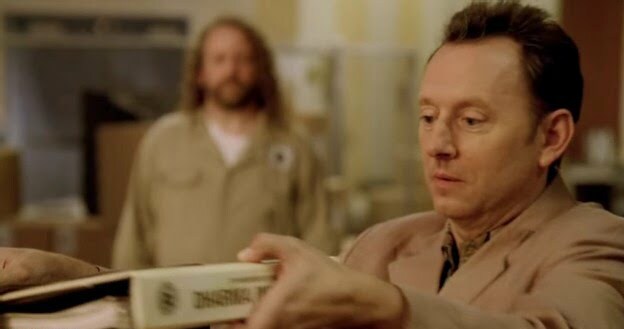 We now know more about Walt's current condition, and received some vague hints as to his future, but nothing about his significant role in the show's first two seasons is any clearer. However, when Ben and Walt, the two characters most responsible for driving the narrative of the show's early years are meeting face to face for the first time in years, it sure FEELS like we're learning something momentous from their interaction. And the fact remains that of all the characters, Walt is perhaps the most neglected, and answers or not, any effort to bring some closure to his character is appreciated. Does "The New Man In Charge" miraculously complete Lost's narrative, tying up every dangling plot thread into a neat package? Certainly not. But then, it was never intended to do so, and anyone expecting it to do so will be disappointed (just like anyone who hadn't been paying attention and somehow expected the finale to wrap up every dangling plot was disappointed in that regard). The Lost producers could spend an entire season's worth of time wrapping up the show's narrative and still likely come up short; compared to that, twelve minutes is an eye blink. Lost's narrative remains flawed and unfinished. Still, with "The New Man in Charge", it now stands slightly less unfinished than before, and that's better than nothing. 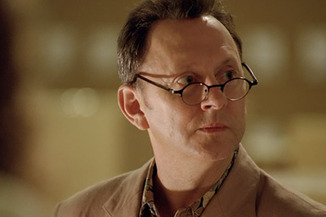 And it was fun spending a few more minutes with Ben Linus, seeing Hurley smiling and at ease as the new Jacob, and getting one last taste of Lost, frustrating narrative incompleteness and all. The Dharma warehouse is located on Guam, which is where Ilana purported to be taking Sayid when they boarded Ajira 316 (remember Ilana? There was a character and storyline that went nowhere fast...). The island's (changing) location is given to the warehouse via the Lamp Post station, the station located under the church in LA where Eloise Hawking instructed the Oceanic Six on how to get back to the island, and the church where, in the Sideways universe, everyone gathered before moving on. The Hydra orientation video shows the same collars being affixed to polar bears that Charlotte found in the Tunisian desert in season four's "Confirmed Dead". The collars are a tracking device. Walt is staying in the same mental hospital Hurley was at under the name Keith Johnson. Michael's post-island alias was Kevin Johnson. 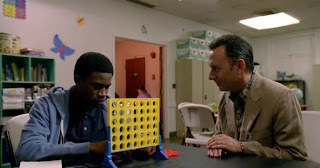 In the hospital, Walt is playing Connect Four, just like Leonard (the person from whom Hurley learned the numbers) and Hurley. Jacob's theme music plays when Hurley appears. Hurley, Ben and Walt drive off in an apparently-refurbished Dharma VW bus (it looks in better shape than most of the thirty-year-old buses). The Dharma pallet drops are packaged at a warehouse in Guam. They receive the coordinates of the island via an automated process running at the Lamp Post station. The pallets are then loaded onto automated drones programmed with the location of the island. In the beginning of the orientation film, Dr. Chang introduces him as such, and in the name of security, asks the viewer to "not divulge my name to any outside parties. I wouldn't want to have to resort to using an alias in the future." So presumably, he started using alias in the other videos in the name of security and to keep his identity a secret (from the Others, most likely). That damn Hurley bird that way too many people obsessed about was apparently a product of genetic experimentation done by Dharma at the Hydra station. As suspected, the polar bears were trained to turn the Frozen Donkey Wheel in order to test the islands unique electromagnetic properties. Polar bears were used because of the cold temperatures in the Donkey Wheel chamber. The island's electromagnetic energy has adverse affects on pregnancy. Room 23 was used to interrogate the Others, in order to "better understand the Hostiles' way of life, their origins, and particularly their worship of an island deity they refer to as 'Jacob'", and then to induce amnesia of the interrogation via drugs, sound and the crazy film, in order to maintain the truce. Walt knows his father died. Also, the complete series box set includes, amongst its extras, an excerpt from the log of the Black Rock. I didn't buy the complete set, but read a transcript of the log online. One passages discusses an away team sent from the ship while it was near the island that exchanged musket fire with another boat which vanished in a flash of heavenly light. So it was an away team from the Black Rock that was chasing Sawyer and company in the outrigger in season five's "This Place is Death." Since the EM energy is confirmed to be harmful to pregnancies, is it safe to assume, as many do, that the detonation of Jughead released enough of that energy onto the island that the entire island became harmful to pregnancies? What job will Walt be performing? How is he going to help his father move on? To be fair, the film explains that polar bears are used because of they're smart enough to be trained to do what Dharma needs them to do (turn the Donkey Wheel) and because they are suited for the climate surrounding the Donkey Wheel (cold). Also, it makes a big deal about following the safety protocols when dealing with the bears, and not to get attached to them. 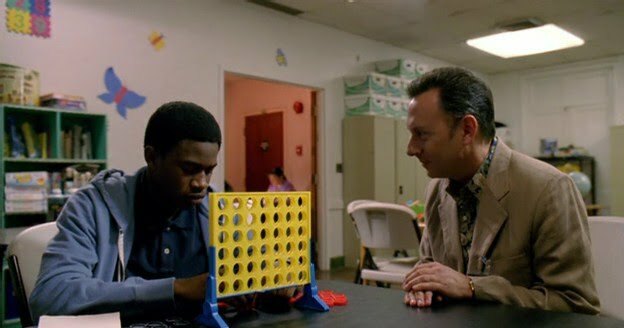 There's a humorous bit where, when talking about the importance of following the rules, there's a shot of a guy locking the cage. As the camera pulls back, you see he's missing an arm. Wakka Wakka! It was not the radiation of the whole island that causes pregnancy problems, it was specifically the radiation from the Orchid Station, AKA, the frozen donkey wheel. In the opening scene of season 5, Dharma breaks through into that chamber causing the whole island to shake and releasing that radiation. Therefore, pregnancy problems were not an issue before the Orchid was built, which explains why Juliet was able to deliver baby Ethan without any problems. This also explains why Ben was so keen on trying to fix it, since he made the call to exterminate Dharma and was trying to clean up their mess. I dunno...I don't recall the shaking when the Orchid Station chamber was breached in the season five premiere; it seemed a big deal that just that one guy came out with a bloody nose, having come in contact with the EM energy, and it didn't seem like an island-level event. But it has been awhile since I watched that episode. Energy at the Orchid Station=bad for early term pregnancies. Energy at the Orchid Station=the island's EM energy, which can be found in pockets all over the island (like where the wells were dug, and the future Swan site, as well as where the Donkey Wheel was embedded beneath the Orchid Station). Therefore, when the Incident hit that pocket of EM energy and released it, all that bad-for-pregnancies energy got released, making the island as a whole bad for pregnancies, not just the areas near pockets of that energy. Juliet was able to deliver baby Ethan because he was born before the Incident bathed the island in that energy, and Chang didn't mention the Swan site in the Hydra orientation film because it was presumably (film #1) made before Dharma discovered the pocket of energy that became the Swan site. Of course, the show could have just made all this clearer instead of making us connect the dots ourselves, but that's a whole 'nother discussion. You may be shocked to hear this, but other animals can handle the cold too. Specifically since the Frozen Donkey Wheel can't be THAT cold since humans can be in their with some of their skin exposed. @Dr. BitzYou may be shocked to hear this, but other animals can handle the cold too. Yes, but would these other (possibly-mythical) cold-handling animals you speak of appear as dramatically out-of-place if discovered on a tropical island as polar bears? I'm intrigued by this bonus dvd and although you did spell everything out I can't wait to watch it. I miss Lost but I'm also glad it's over. I'm not really into Tantric Television, it's so stressful. And as much as people boast, Tantric doesn't make the end that much more enjoyable. Also, I watched Star Trek again for the millionth time and am again reminded of the HUGE soundtrack similarities. It's like he didn't even compose anything new, he just added the bass farting. But that's it!! But I guess all composers are like that. le sigh. Ha! I love the term Tantric Television. I'm a sucker for it myself. They have to get it right one of these time, right?!?! Right? I watched Star Trek again for the millionth time and am again reminded of the HUGE soundtrack similarities. It's like he didn't even compose anything new, he just added the bass farting. But that's it!! But I guess all composers are like that. Really? I haven't noticed much similarity between Giacchino's Lost work and Star Trek. But maybe that's just because I've haven't listened to much of the Lost music independent of the show. Most composers have a specific style that, over time, you can come to recognize, but some are more shameless about re-using old material than others. James Horner is the worst when it comes to this. I love the man's music, but he is not afraid to lift, almost note for note, whole melodies from his past work and incorporate it into new scores (like Beautiful Mind and Bicentennial Man, or Braveheart and Deep Impact).